I am trying to insert a user icon inside username input field. I've tried one of the solution from the similar question knowing that background-image property won't work since Font Awesome is a font. The following is my approach and I can't get the icon display. I have font face declared in the default font awesome css so I wasn't sure if adding font-family above was the right approach. Browsers that don’t support the placeholder attribute will simply ignore it. The before content selector selects the input: input[type="text"]:before. You should select the wrapper: .wrapper:before. See http://jsfiddle.net/allcaps/gA4rx/ . I also added the placeholder suggestion where the wrapper is redundant. You could use a wrapper. Inside the wrapper, add the font awesome element i and the input element. Having read various versions of this question and searching around I've come up with quite a clean, js-free, solution. It's similar to @allcaps solution but avoids the issue of the input font being changed away from the main document font. Use the ::input-placeholder attribute to specifically style the placeholder text. This allows you to use your icon font as the placeholder font and your body (or other font) as the actual input text. Currently you need to specify vendor-specific selectors. This works well as long as you don't need a combination of icon and text in your input element. If you do then you'll need to put up with the placeholder text being default browser font (plain serif on mine) for words. Note that you need to define each browser-specific selector as a seperate rule. If you combine them the browser will ignore it. Make clickable icon to focus inside the text input element. 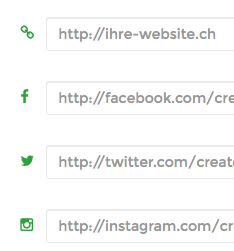 Just add whichever icon you like inside the <i> tag, from Font Awesome library and enjoy the results. I found the easiest way using bootstrap 4. For me, an easy way to have an icon "within" a text input without having to try to use pseudo-elements with font awesome unicode etc, is to have the text input and the icon within a wrapper element which we will position relative, and then position both the search input and the font awesome icon absolute. The same way we do with background images and text, we would do here. I feel this is good for beginners as well, as css positioning is something a beginner should learn in the beginning of their coding journey, so the code is easy to understand and reuse. Not the answer you're looking for? Browse other questions tagged html css fonts font-awesome or ask your own question. How to add font awesome icon inside input field? How do I get a Fontawesome version 5 icon inside an input element? How to add fa fa icons in text field, yii framework?